Hungary says critical open letter an "obvious political attack"
The Hungarian government has fired back at the open letter written by a former German finance minister and three former EU Commissioners, revealed exclusively on euronews, as an "obvious political attack". 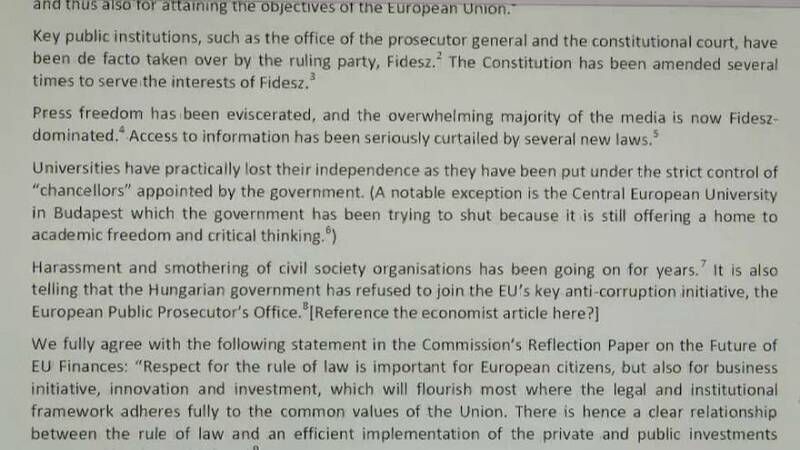 The letter calls on the European Commission to turn off all money flows to Budapest until basic democratic freedoms are reinstated and corruption counteracted, full press freedom is restored, and universities and key public institutions regain their independence. The men putting their signatures to the criticisms are Germany's Hans Eichel and ex-commissioners: Pascal Lamy, Franz Fischler and Yannis Paleokrassas. The ruling Fidesz party dismisses the claims as merely Hungary's opposition stirring up trouble in Brussels and getting the Commission to do its work for it. However Prime Minister Viktor Orban has clashed regularly with Brussels since taking office, notably on refusing to accept migrants. "This is a political attack from the left. The liberals and the socialists, opponents of the Fidesz-Christian Democrats governing coalition, demand this from the European Commission. It doesn`t have anything to do with real life and the reality," said the Minister of the Prime Minister's Office Janos Lazar. Orban's "Hungary First" policies and Brussels-bashing make him popular at home, but his "illiberal democracy" polices irritate his EU partners, as does his cosy relationship with fellow authoritarian, Russia's President Putin.